This stunning home is located in the exclusive gated community of Montana De Oro RanchT and sits on a cul-de-sac acre lot. Gorgeous courtyard entrance, patio and driveway with pavers. The chef’s kitchen has stainless steel appliances and custom granite counter tops, walk in pantry and temperature controlled wine closet. All 5 bedrooms have their own bathroom. The backyard has a luscious oasis of thick trees, pool & spa, full sized lighted tennis court, basketball hoop and children’s playground. This stunning home also has an attached casita with kitchenette accessible through courtyard. Laundry room has lots of cabinets, a sink and granite counter tops. The garage comes equipped with cabinets, shelves and overhead racks for extra storage. This gorgeous property features 4CG & RV gate. Directions: West on Pinnacle Peak, North on 93rd Avenue, travel one block North, East toMontana de Oro security gate. Approximate size: 42017.00 sq. ft. 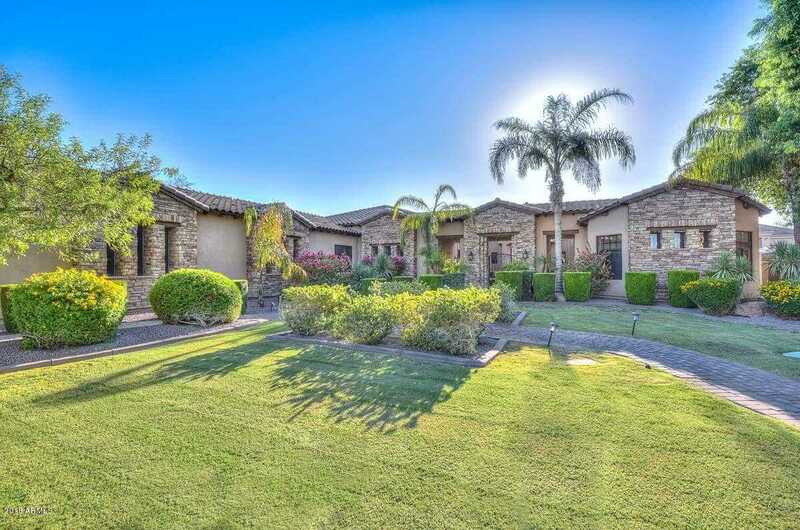 Please, send me more information on this property: MLS# 5814136 – $1,490,000 – 23418 N Camino Villa Court, Peoria, AZ 85383. I would like to schedule a private showing for this property: MLS# 5814136 – $1,490,000 – 23418 N Camino Villa Court, Peoria, AZ 85383.